Everytime I spot a rainbow I get a bit excited! 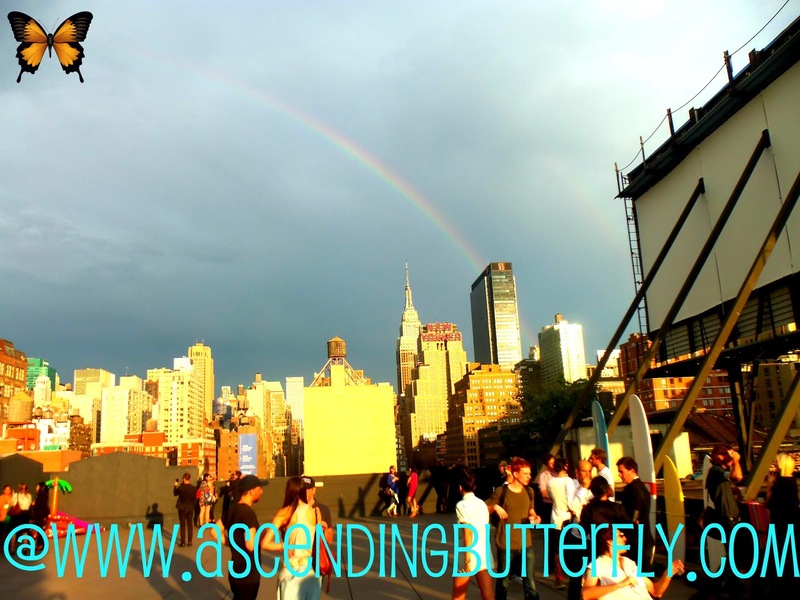 I was lucky enough to snap a picture of this rainbow behind The New Yorker sign while attending a Rooftop Beach Party as part of Elements Showcase in New York City. Elements was fantastic and will get a full recap with all the brands I met in another post! Beautiful shot Tracy! It is always great to see a rainbow. Thanks for stopping by my blog and sharing your comments. I am now following your blog in several ways. Have a good day. @Judy Haughton-James - I love discovering new bloggie friends with the Wordless Wednesday Blog Hop! Have a great one, hope you find some rainbows today too! I love that 'rainbowtastic week' <- You too! Seening rainbows always make me smile. @Big Happy Buddha - Rainbows and Laughing Children are definitely up there! Gorgeous picture! I love rainbows, and what a fun place to see one! @Mer - I think that's the beauty of rainbows, they always show up when and where we least expect them! Great shot, roof top beach party. Only in New York.